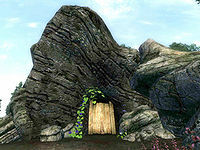 Fyrelight Cave is a medium-sized cave between Skingrad and Kvatch containing monsters. 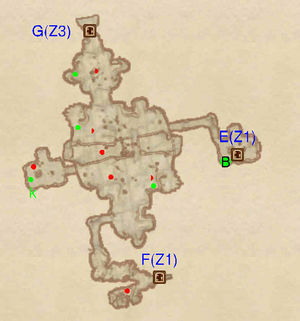 It contains three zones: Fyrelight Cave, Fyrelight - Deep Canyon, and Fyrelight - The Lost Sump. This cave contains 15 Cairn Bolete plants and 56 Wisp Stalk plants. 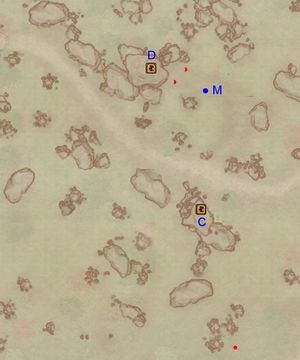 This location's map marker (M on map) is named Fyrelight Cave (editor name FyrelightCaveMapMarker). The entrance door is S of the marker, 130 feet away. Make sure you enter the cave from the entrance on the hill, through door D. Upon entering, you will find yourself in a large room with up to two enemies guarding a minor loot chest. 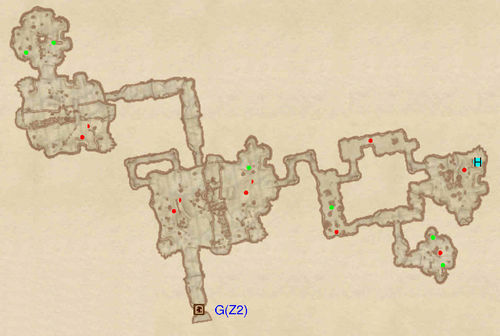 Head north into a small room and loot the chest nearby, but don't jump down into the corridor below. Head back to the previous room and follow the tunnel in the southern corner. 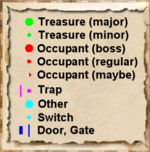 You will next come across a swinging mace trap (I), activated by the pressure plate at H. There are up to three enemies nearby: one in the small room to your left and two to your right. 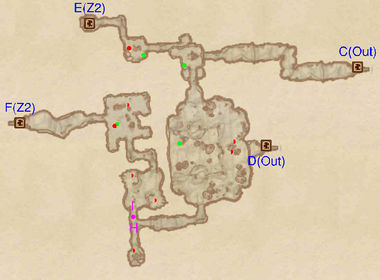 Use the narrowness of the tunnels to avoid fighting them all at once. In the final room you will find a minor loot chest, up to two enemies and a large concentration of wisp stalk plants. Head over to the next zone through door F.
Once you return to this zone through door E, simply make your way east to door C, which leads to the roadside entrance. Along the way you will find a monster and a minor loot chest. Be ready when entering from door F, as you will be immediately fighting a monster. The next room is a large one, cut in half by a canyon running east to west. There are up to three enemies on your level, of which up to two on your side of the canyon. The fighting will probably alert the monsters below, but they won't be able to reach you. Snipe at them from above, loot the two chests and head north. The final room contains another chest and potentially a monster. Head to the third zone through door G.
On your way back from the next zone, jump down into the canyon. Head west and defeat the monster guarding the chest at k. Inside is the key unlocking door E. Backtrack east, loot the boss chest at B and head back to the first zone. The first room you encounter is again split north to south by a canyon filled with water. There are up to two enemies on each side and a minor loot chest on the eastern side. Cross over to that side using the large roots and follow the tunnel leading further east. The next set of rooms are a loop, so it doesn't matter which way round you go. There are four rooms, each with a monster inside. There are also three minor loot chests and a dead Treasure Hunter at H.
Head back to the first room and dive into the canyon. You will need to swim through two corridors, although you will be able to catch your breath halfway through. In the final room are up to two monsters and two minor loot chests. This page was last modified on 25 March 2018, at 02:53.